On 19 and 20 September 2018, the NNR delegation led by CEO Dr Tyobeka met with bilateral counterparts from the National Atomic Energy Agency of the Republic of Poland (PAA), Canadian Nuclear Safety Commission (CNSC) and Nuclear Safety Administration of China (NNSA) respectively. The meetings reflected on experiences of working together and discussed future themes and practical proggrammes for collaboration among counterparts. NNR meets with the CNSC delegation led by the new President of the CNSC Ms Rumina Velshi. 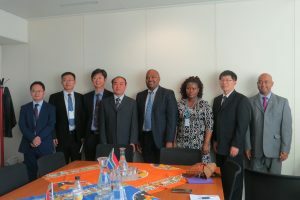 NNR meets with the NNSA delegation led by Vice Administrator Mr Tang Bo.